At first glance there may not seem to be much of a difference between the Ogio Renegade and Gambit but as with most things, the devil is in the details and each backpack offers unique features worth considering. Below we will highlight some of these differences so you can make the best choice before pulling the trigger on a new backpack. Both the Ogio Renegade and Gambit share more similarities than differences. Both backpacks feature almost identical pockets and organizational compartments as well as roomy main compartments. Where they differ is in carrying volume and laptop carry (more in on this below). The Ogio Gambit is the larger of the two bags with a volume of 2,050 cubic inches while the Ogio Renegade maxes it’s volume at 1,800 cubic inches. Although the Ogio Renegade has a smaller carrying capacity, it’s overall size is nearly identical to the Gambit. The only real difference in external dimensions is that the Ogio Renegade is 1 inch shorter in width. Much of the smaller internal space inside the Ogio Renegade is due to it’s suspending laptop compartment that takes up more internal room. Besides differing main compartment room, the external side and front pockets are nearly identical. Both feature a useful front pocket organizer and it’s own padded tablet pocket. What we like about both of these bags is that their external pockets are padded which makes it perfect for carrying cameras, phones and other expensive tech. One difference between the Ogio Renegade and Gambit is the material used in the construction of each backpack. The Ogio Gambit is made from 420D Polyester Oxford material while the Renegade is made from a more robust 600D Polyester Pindot. When compared to the Gambit, the Ogio Renegade has a visually tighter knit and a thicker feel to the touch making it a more robust backpack that is more resistant to tears and punctures over time. Ogio Gambit (left) vs Ogio Renegade RSS (right) difference in material. 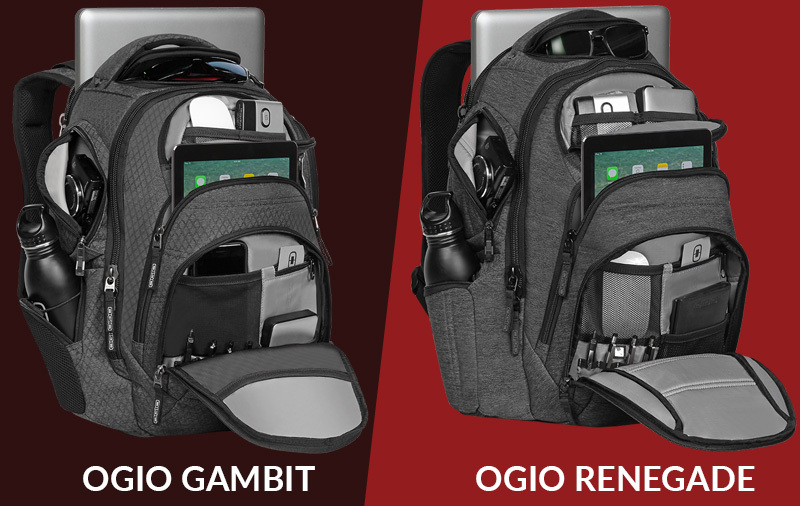 The main difference between the Ogio Gambit and Renegade is their laptop carry compartment designs. The Ogio Gambit has a standard padded laptop compartment that can comfortably fit laptops up to 15 inches. The laptop compartment is adequately padded and fleece lined to prevent scratches and dings when on the move. It’s top loading zip entry makes accessing your laptop quick and easy. The Ogio Renegade RSS takes a different approach to laptop carry. Instead of a standard padded sleeve it features a unique armor protected laptop compartment that suspends the laptop and allows for an added buffer space to protect the laptop from bumps and falls. For those serious about protecting their expensive laptops, the Ogio Renegade may be the better choice. The Ogio Renegade’s laptop compartment can fit laptops up to 15 inches and even some slimmer 17 inches laptops such as the Macbook Pro or an Ultra Book. The Ogio Renegade and Gambit also differ when it comes to laptop access. One caveat we have about the Ogio Renegade is that it’s laptop compartment only partially zippers open. In our opinion, this makes accessing your laptop a bit of an unnecessary challenge depending on it’s size. The Ogio Gambit’s laptop compartment however does zip all the way open giving you plenty of room to access your laptop with ease. When it comes to laptop accessibility, the Ogio Gambit is the better choice. When it comes to shoulder straps and overall comfort both backpacks do a great job at keeping you comfortable and secure even under full loads. Both the Gambit and Renegade feature foam padded shoulder straps with an integrated sternum strap. Each backpack also features a little stash zip pocket on one shoulder strap for quick access to small items. The back panel is Ogio’s own HUB (Hybrid Unibody Backpanel) for extra cushion and support. One minor difference can be seen in each backpack’s respective top grab handle. The Renegade has a nicer fully padded grab handle while the Ogio Gambit 17 only features padding in the center of the grab handle. This is a very minor detail and shouldn’t be a deal breaker for anyone, but it’s still worth noting. The Ogio Renegade offers more color options than the Ogio Gambit 17. Currently the Renegade RSS is available in black, black “pindot” and dark static. The dark static is a nice dark gray color with black hardware and accents. The Ogio Gambit 17 is currently only available in black and graphite. These colors are simple and understated which is what you want in a backpack that can carry some serious tech and important belongings. Choose the Ogio Renegade if… You care about keeping your tech safe. The Ogio Renegade RSS has a unique suspension laptop compartment built to keep your laptop safe from bangs and drops. The tablet and padded pockets are also great for cameras, external hard drives and other essentials. Add it’s 600D polyester construction to the mix and you have a tough backpack that can take on just about any situation. Choose the Ogio Gambit if… You need more carrying capacity for school, travel or business. The Ogio Gambit 17 is nearly identical to the Ogio Renegade in terms of pockets and organization but has the added main compartment room that is perfect for travel or those busy school/work days. If you can do without the added laptop protection and just need a reliable backpack than the Ogio Gambit is the bag for you.